Thank you for calling me a liar and for only believing what you read on the web in terms of the Yardbirds tour schedule. I get it now. If you read in a book that the moon was made of green cheese, then it must be, regardless of incontrovertible evidence. I tried to enlighten you to the truth of the matter, but you only prefer to believe a book. Go ahead, but I really must tell you that the moon is not made out of green cheese,, but you just keep clinging to your book and whatever it says. You must be a complete droit to not choose to believe someone whom was there and saw it. 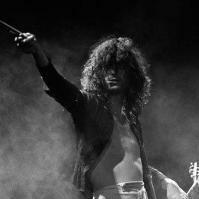 You have no idea if the Yardbirds did or did not choose to speak to the Wichita drummer about joining their band, other than some hysteria on your part, that you beleive couldn't possibly be true. Quite frankly, I don't believe a word you have written No one could be that foolish. . I also think you owe Steve Brosemer a matter of apolgy for calling him a liar as well. Here is what I would like you to do Mr. Know-It-All. Go on Facebook to a site called Kansas Music Hall of Fame. Join and then post that you do not believe for one moment that the Yardbirds played at the Cotillion in 8/66, and that you also do not believe it ever happened that the Yardbirds drummer passed out and had to be replaced by local drummer Neil McGaugh.................go ahead..............say it...............say that you don't believe that one word of it ever happened. And then prepare for the onslaught and laughter. The MacLean's Toothpaste ad is completely new to me. I wonder what era of the Yardbirds it's from? The toothpaste was available in the US. This is the original vinyl: (https://www.popsike.com/MACLEANS-TOOTHPASTE-66-RADIO-JINGLES-LP-THE-YARDBIRDS/120063677723.html )...my guess is 66, maybe Jeff Beck, but could also be session musicians with just Keith Relf. The track on the MacLeans Toothpaste advert sounds like a variation of "Happenings Ten Years Time Ago" by the Beck/Page version of the band, although it doesn't sound like either of them are playing on the track IMO. You are nothing but a twit................Oh, I just said that it is not listed on some book I read. I never said that it didn't happen. I hope you go back to your meds. I know exactly what you wrote, but you are not even man enough to admit it. Next. No one really wants to be exposed to the bickering and arguing, it's ruining this thread. Please take it elsewhere. Thank you! Anyone know where this was taken ? 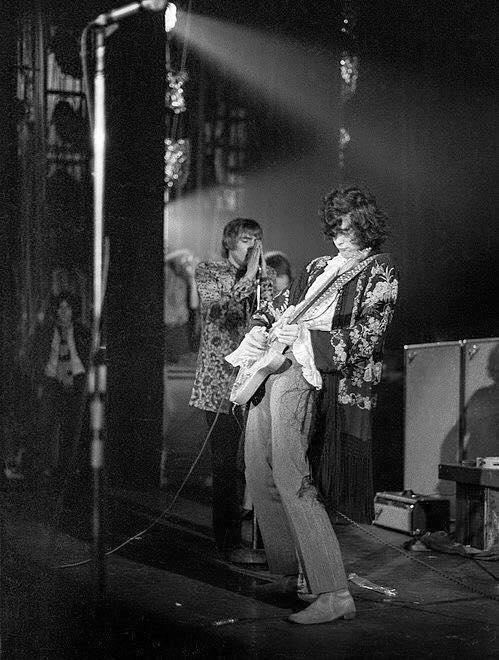 Photographer Roy Lewis - "Photo of the Yardbirds in performance at the Village Theater (later the Fillmore East) in November, 1967. A friend and I rented a Nikon rangefinder and then convinced the staff that we were press so that we could shoot from the wings of the theater. 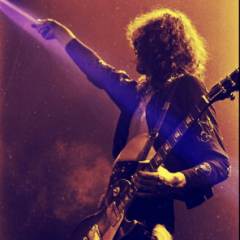 Got this moment of Jimmy Page ripping out a solo." Archives for the Wichita Beacon are available for a fee here. 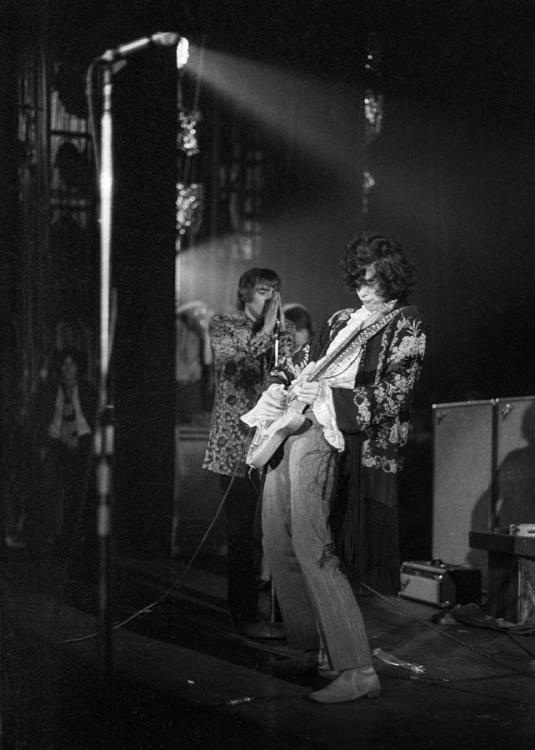 Even without paying for access, from the small previews, it's clear that the Yardbirds played Wichita in both 1966 and 1967 (and Jim McCarty collapsed during the show in 67). Wichita Beacon, August 12th, 1966: English Rock The Yardbirds, an English (band?) with five hits to their credit (will play in?) Wichita Monday [August 15th, 1966] for a KLEO (radio?) dance at the Cotilion Ballroom. The dance will be from 7 ... and the group will give two performances during the evening -on(? )...another at 10pm. 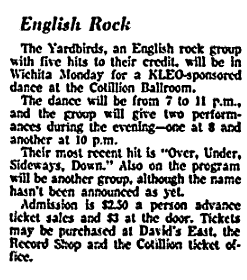 Wichita Beacon, October 18th, 1967: THE YARDBIRDS will play ...at the Cotillion. Also playing ... Secret and the Avalons, two w(inners of the?) battle of the bands. 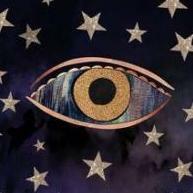 Admission .... from 6 to 10 p.m. Advance ....at the Record Shop, 221 E. Wi...(and at?) the Cotillion. Great find. I'll pay for archive access this weekend to retrieve the articles. We know they took a plane to the show in Great Falls, MT the day prior, so they must have been flown down to Wichita, KS to make this date. Great find. I'll pay for archive access this weekend to retrieve the articles. 1. Wichita Beacon, August 12, 1966. 2. Wichita Beacon, October 4, 1967. 3. Wichita Beacon, October 11, 1967. 4. Wichita Beacon, October 18, 1967. 5. Wichita Beacon, October 25, 1967. Yardbirds Live and Rare- what's your opinion? Is it worth the $50 for someone who isn't a big Yardbirds fan? I'd only be buying it for the Page material.